An imaginative, strikingly different design combining two colours, in contrast to each other. 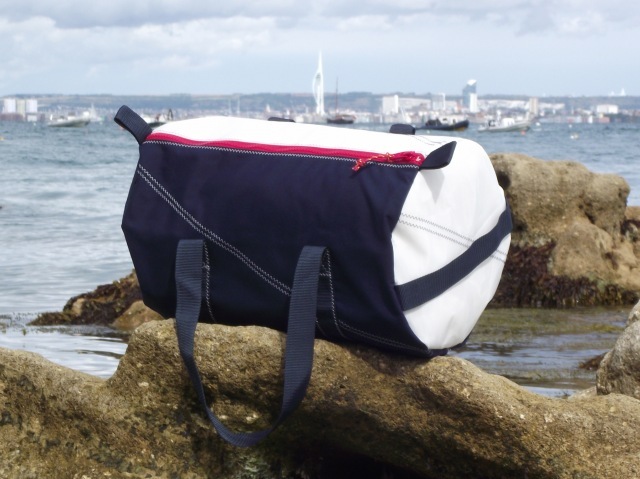 One side of the bag is made from navy blue canvas and the other side is white sailcloth, they are divided by a bright red chunky zip. We add an extra layer of navy blue canvas to the base of the bag, to protect the handles, and add durability to the bag. Inside there are six large pockets, three on either side. 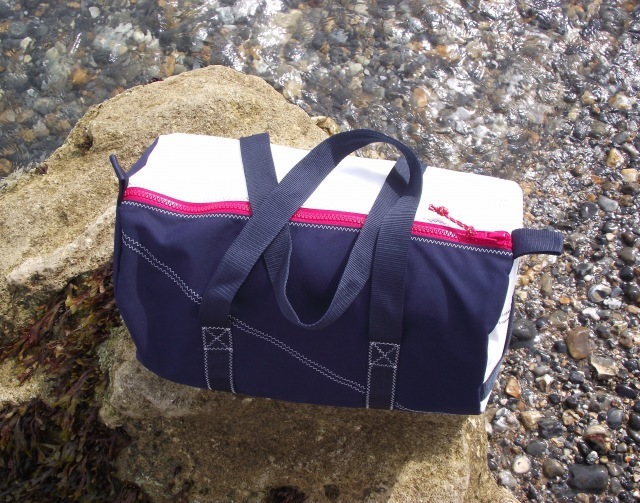 There is one navy blue canvas end and one white sailcloth end, with a navy blue webbing handle. The navy blue soft webbing handles are stitched on and they go right around the body of the bag. The bright red, robust zip sliders have a coloured pull cord. On the large size we add two zip sliders to allow access from both ends of the bag. There are six internal pockets, three on either side of the bag, are in the same fabric as the outside of the bag. We add two rows of decorative traditional sailmakers zigzag stitching on either side of the bag, which are also in contrasting coloured U.V. resistant thread. This thread is used throughout the bag. The ends of the bags are sewn in with three rows of stitching. Available in small, medium and large sizes of kitbag/holdalls. 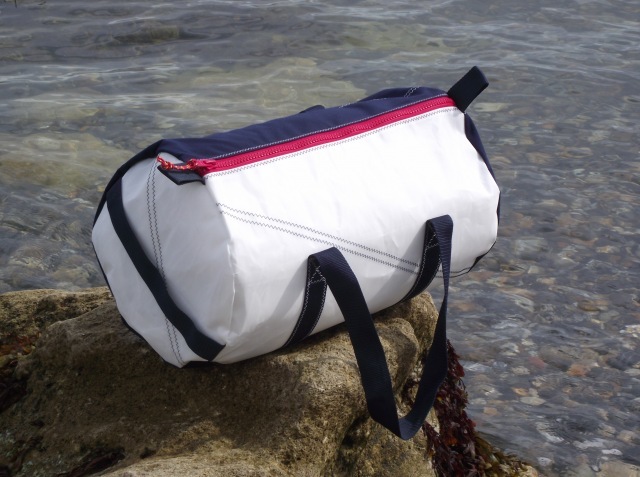 We also offer this design as a sailcloth wash bag. 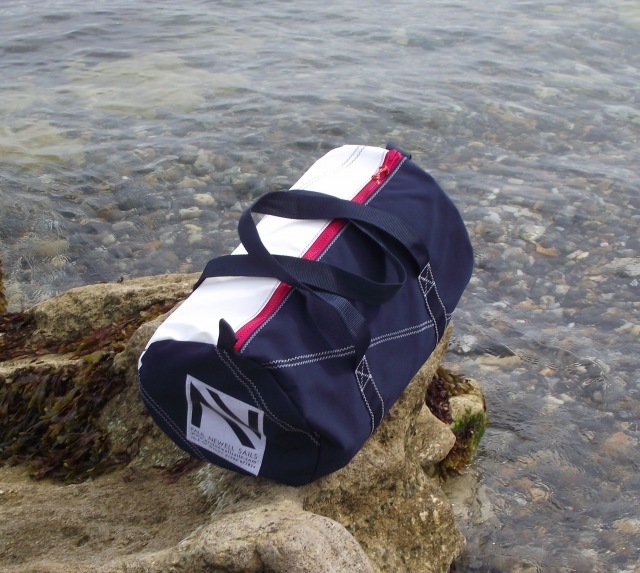 Medium Kit Bag: 50cm length x 32cm diameter. 40 litres approx. Large Kit Bag: 60cm length x 38cm diameter. 68 litres approx.